It only seems fitting to have a native Western Australian Christmas Tree as the feature plant in the lead up to Christmas. 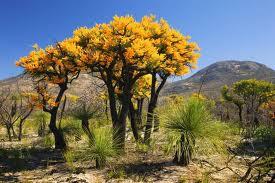 WA Christmas Tree or Nuytsia floribunda is a true mistletoe. It is a root parasite that does not grow directly on the the host plant. It can grow to 10 metres in height. Nuytsia floribunda is extremely common and widespread, mostly within 50 km of the coast from north of Geraldton to Israelite Bay abutting the Nullarbor region. It is not particular of soil type or even drainage providing it is not waterlogged for prolonged periods, nor is it specific to a host, as it will attach itself via a haustorial collar to extract nutrients from almost any host plant. They will even attack underground electric cables to short out the entire house, unless protected within a PVC pipe. Small irrigation pipes are also destroyed by the roots of this plant, so it can be an expensive addition to a domestic garden and one few neighbours will appreciate. This highly adaptable plant is able to survive in paddocks where all native vegetation has been removed and replaced exclusively by introduced grasses. Also despite its spectacular flowers and ornamental desirability for garden use, it will hunt down the roots of most plants within a 50 metre radius and unless they can quickly develop alternative roots, will die within a few years. Nuytsia floribunda is difficult to permanently remove, as they will rapidly regrow their trunk if knocked over, providing the root system is not too badly damaged. The plant is not often cultivated by nurseries due to difficulty in propagation. Propagation is reported to be relatively easy but the plants generally do not survive more than a year or two.